Keepers of the Flame will document histories of JA pioneers in San Gabriel Valley. Kiyoko Okada with interviewer Aya Kamimura. The East San Gabriel Valley Japanese Community Center (ESGVJCC) is looking to interview Japanese Americans who lived in the San Gabriel Valley between 1910 and 1955. 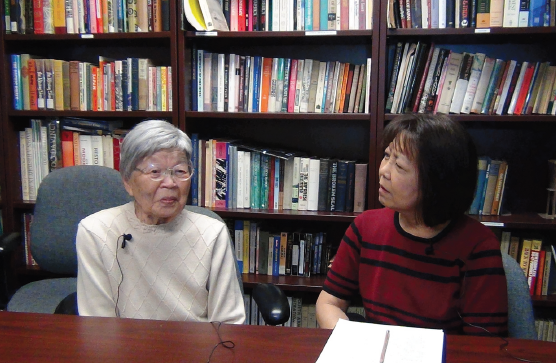 “Keepers of the Flame” is an oral history project of the ESGVJCC, started in late 2012, dedicated to recording and preserving the stories and personal histories of the pre- and post-World War II Japanese American pioneers of the San Gabriel Valley. Bacon Sakatani, a Nisei elder of the ESGVJCC, is the inspirational founder of the group. These Japanese American founders are in their “twilight time.” The flame of their lives burns softer. It is time to gather their stories so that the light, warmth, and wisdom of their lives will never be extinguished or forgotten. The personal stories of our elders are their legacy. And their legacy is our heritage. To date, there is no comprehensive documented history about the important pioneering role that Japanese Americans performed in developing the San Gabriel Valley. The current plans for the collected works are to distribute them in the following formats: digital archives accessible to the community, publications, oral performance and readings, and documentaries. Time is of the utmost importance. We’ve successfully collected over 20 interviews since Keepers of the Flame’s conception, and we need your help to keep our project going. Please help connect us with potential interviewees — any elders you may know who lived in the San Gabriel Valley before and after World War II. Volunteers are needed as well, to help with interviewing, transcribing, research, collections of family histories, writing, camera work, recording, fundraising and more. This is an intergenerational project, so all ages are welcome to join. For more information, please contact Michelle Okawa at [email protected] or call our office at (626) 960-2566.